Martilyo Gang strike again! 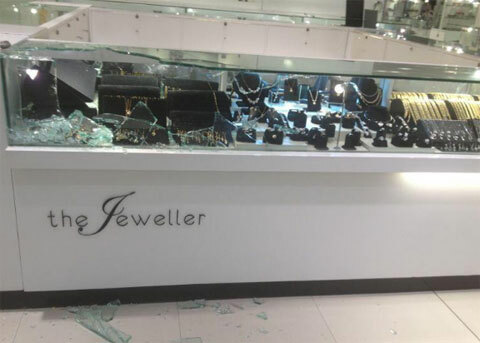 now they're robbed the Jewelry store in the ground floor of SM Megamall on Saturday night, January 26, 2013. They stole 150 pieces of jewelry in the F and C Jewelry Store. It was happened around 7:26 p.m. in SM Megamall Building B and they do the crime in just 2 minutes. The jewelry are: 71 pieces “Saudi” gold necklace, 52 pendants, 4 pieces of men’s rings, 10 pieces of gold rings, 21 sets of earrings, and another 17 pieces of gold chains. The actual footage of the incident caught on CCTV showed robbers wearing white shirts and jeans, they also hand a pipe wrench to break the glass of the jewelry display cases. The video below is the actual footage of the ANC News. Comments or suggestions about "SM Megamall Jewelry Store Robbed by Martilyo Gang" is important to us, you may share it by using the comment box below.